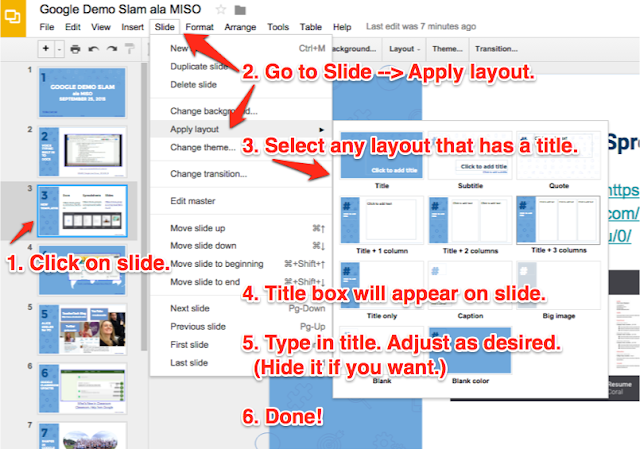 It had been there all along I know, but I just recently discovered that those title boxes on Google slides organize the finished slideshow presentation and help readers to access the content easily. 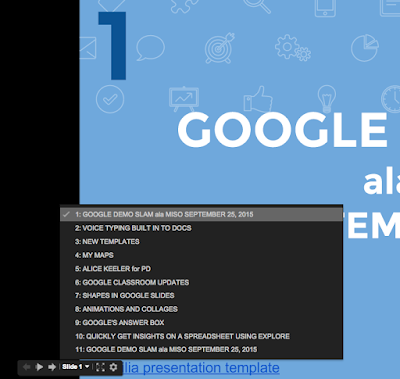 Before I start to view a Google slideshow, I like to see how many slides are in the show. Is it going to be quick, or is it something I want to enjoy over a cup of tea? While I'm previewing length, I like to peek at what will be covered in the slideshow. And yes, I admit that I often jump right away to a particular slide that piques my interest. So, yes, those title boxes are very handy. Mahalo to all of you presenters who take that extra step for us readers! Here's how to add a title to a slide, after you've already done your slide show. 2. Go to Slide --> Apply layout. 3. Select any layout that has a title box. 4. The title box will appear on the slide(s).